Jurassic Park from Microgaming is a visually stunning and genuinely absorbing game based upon the blockbuster smash that was the Jurassic Park franchise and they have included a lot of features from the trilogy that are sure to keep the dinosaur fans amongst you more than happy. The game is one of the few to feature parallax scroll reels and the potential stakes that gamers can lay our range from as little as 30 pence to 15 pounds per spin. The five reels and 243 paylines mean you are never far away from a payout. This latest instalment from Microgaming truly is one to sink your teeth into! The game play, as you might imagine from a Jurassic Park themed slot game is very, ahem, Jurassic themed with regular appearances from the pinnacle predator, Tyrannosaurus Rex, not to mention plenty of his co-stars. T-Rex appears randomly to begin the T-Rex Alert Mode feature which when activated lasts for 6 spins and can add up to 35 Wilds to the reels. This has a massive effect on your potential earnings and is a real winning feature. The Free Spin features are where Microgaming have focused a lot of their efforts though. There are 5 Free Spin modes in total and all of them are activated by getting three or more scatter symbols on the game reels. The scatter symbol in Jurassic Park is a dinosaur egg of indeterminate breed, how very apt. Once you start the game your default Free Spin mode will be T-Rex, which isn’t exactly a bad thing as it can be very lucrative, but once you have played 25 times all of the other 4 modes will become available for you to select. Each Free Spin mode gives you 12 free spins and has its own storyline and soundtrack, just think of it as a reward for playing 25 times or more. Learn more about free spins here. Each of the Free Spin modes entails hours of fun, especially considering each of them come with their arsenal of inbuilt mini-features including mystery multipliers, wild reels, split wilds, winning wilds, wild multipliers and running wilds. These features come either from the Tyrannosaurus Rex game mode or from one of the other cohorts, be it the Velociraptor Free Spin mode, the Triceratops mode, Brachiosaurus mode or the Dilophosaurus Free Spin mode and really add that next level of entertainment to the game just perhaps as you were starting to get comfortable with it after a few plays. At the time of writing, Jurassic Park is not available in a mobile version but hopefully that will soon change. Plenty of casinos have seen the wisdom of offering this slot to their players. You can play it at Casino Room, Thrills, Mr Green, bgo, Comeon and Leo Vegas, to mention only a few. 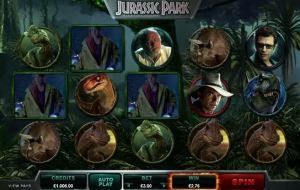 The visuals are stunning, the game play is absolutely seamless and a wide range of bonus features and settings makes it a truly exhilarating game and probably the best Jurassic Park themed slot game out there. Just don’t get too emotionally involved in the scenario, they aren’t real dinosaurs. I don’t think.